Peg was a new client who was ready to dive in deep after her failed relationship so she could finally escape the pain that she had hung onto for far too long. She wanted to be able to have a relationship again someday, but she knew that this last one had wounded her so badly that she would carry that pain into future relationships and she would continue her cycle of heartbreak. She would be overly suspicious, distrusting, and always assuming the worst. She would be guarded so as to not be hurt again, but not open enough to make a connection. She would make a potential future love pay for the sins of past loves, unintentionally sabotaging the relationship so it never really stands a chance. She knew she would just cause herself more heartache if she didn’t heal the hurts and learn to trust herself again. She had been carrying the story around in her mind that men shouldn’t lie. After all, she had a long-term boyfriend that cheated on her repeatedly and to whom lying came easily. She also had a marriage where her husband hid his drinking until it became so bad that it was undeniable and abusive. So, she had plenty of reasons to be suspicious, to not trust men and to keep her heart under lock and key. These men weren’t the only ones that lied. She had lied too. In both instances, she said she knew something was wrong, but because she didn’t have hard proof, she never pushed too hard or trusted her instincts. She lied to herself by thinking that what these men provided inside of these relationships was enough, when she knew in her heart it wasn’t. She lied to herself and them by pretending that her wants and needs weren’t important and orchestrating her life around everyone else. And what she realized was that she had abandoned her own heart, not once or twice, but time after time after time. It would be so easy for Peg to move right into shame and self-loathing from that place, and believe me, she tried. 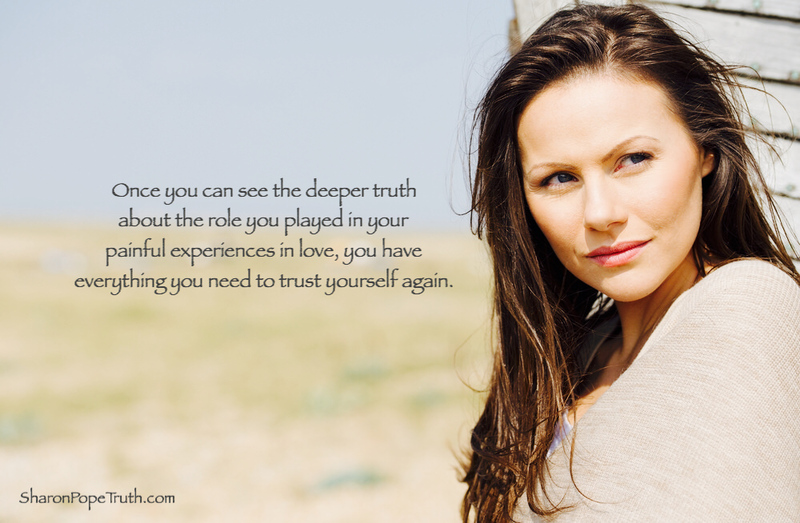 But what I helped her discover was now that she knew what role she had played in her love experiences and what her patterns in relationships had been, all she had to do was shift that one thing and every future relationship would look and feel much different than these past painful relationships. She made a commitment then and there to never to lie to herself again and never to abandon her heart (or needs, or wants or voice). She now had all the power. She had everything she needed to trust herself again. Here’s what Peg had to say: I was stuck and couldn’t move forward. I felt I couldn’t afford the session and overnight realized that I could not afford to pass by his chance, to work with this woman who I somehow felt could get me through this. Within 2 sessions, I am no longer stuck but strong and ready to open my heart again for a new beginning! She is amazing, skilled and has been there.